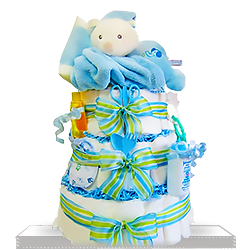 A sleepy little bear sits atop this colorful and festive diaper cake, cuddled into his snuggly blanket. This work of art contains 50 disposable Pampers Swaddlers, but that's just the beginning of the fun! 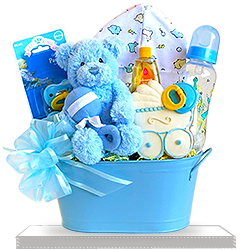 Also in this gift basket are all sorts of handy things to help take care of baby. A receiving blanket, manicure set, fork and spoon, link toys, and scratch mittens. 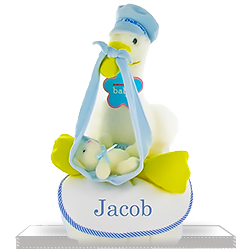 Necessities included are baby shampoo, baby wash, and baby lotion, along with a tube of Desitin. Last, but not least, a blue bear plush toy for junior. 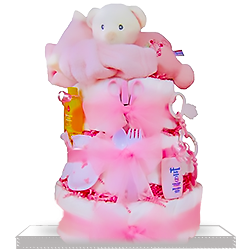 The diaper cake was lovely and arrived on time!!! All the goodies were great, I'm glad it made them happy!!!!! It was very well protected when shipped and came in perfect condition. I get exactly what is pictured. 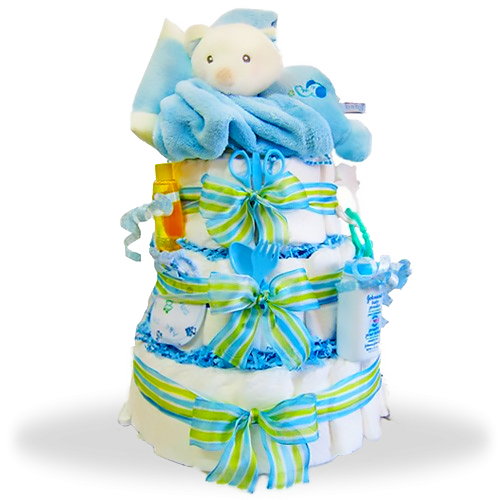 Great cake which is appropriate as a baby shower gift for any family that got bigger. It looks really beautiful and I think that designer’s work worth the money because I wouldn’t be able to arrange a gift so stylishly. Bought it for our grandson’s baptism. Thank you for fast shipping and providing quality items. It was a huge hit! Nice gift. Would give excellent rating if it was not so expensive or bigger.